Dolce Gelato on College | Mmm, Tasty! With the TTC strike this past weekend, Rich and I decided to take a stroll down to College St to find something fun to do. One thing that I’ve been meaning to do since the weather warmed up is check out all the awesome Gelato places that Toronto has to offer. Two of them just happen to be on the strip of College that we were on, in Little Italy. We decided to head over to Dolce, which still had some room on its patio for people watching. The picture from Rich’s camera phone shows four different flavours: in the front, pistachio and amaretto, and in the back (blurry, unfortunately) is coconut and dolce de leche. All the flavours were fantastic, and I’m looking forward to heading here at least a few times over the summer. My only complaint was that they didn’t have my favourite flavour, zabaglione. However, they probably rotate flavours, so I’ll probably find it on another trip. 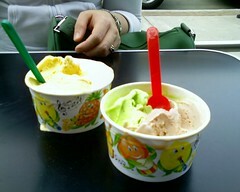 Dolce Gelato, 697 College St, Toronto. 416-915-0756. All moved in, and ready to bake!